In a holiday-shortened trading week, the index consolidated sideways with a slight upward bias and gained 0.6% on a weekly closing basis. However, bears defended the ‘resistance zone’ well and prevented the ‘golden cross’ for the time being. Daily technical indicators are looking overbought. MACD is rising above its signal line in overbought zone. RSI is facing resistance from the edge of its overbought zone. Slow stochastic is moving sideways inside its overbought zone, but is showing negative divergence by touching a lower top. Some more consolidation can be expected before the index makes an attempt to cross above the resistance zone. Satisfactory resolution of the US-China trade spat may provide the necessary incentive to bulls. On longer term weekly chart (not shown), the index closed above its three weekly EMAs in a long-term bull market for the fourth week in a row. Weekly MACD is rising above its signal line in bearish zone. RSI is rising above its 50% level. Slow stochastic is climbing inside its overbought zone. Some more upside is possible. 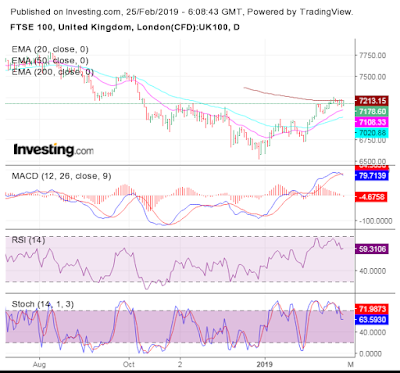 The pullback rally on the daily bar chart pattern of FTSE 100 stalled at the 200 day EMA. The index consolidated sideways as it struggled to move above the 7200 level, and eventually closed below it with a weekly loss of 0.8%. Daily technical indicators are correcting overbought conditions. MACD has crossed below its signal line in bullish zone. 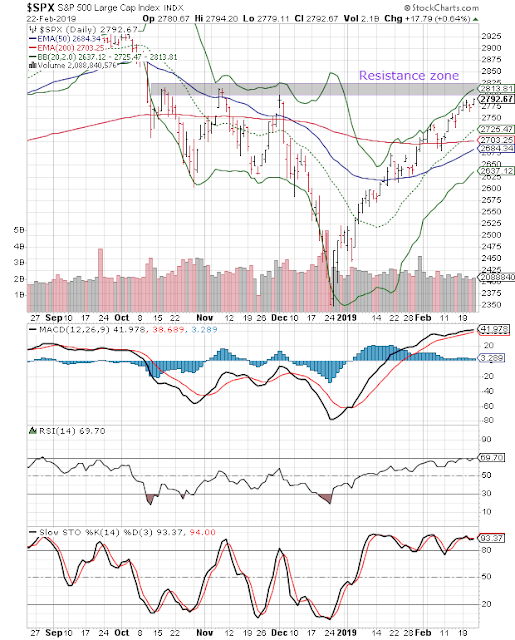 RSI has dropped down after facing resistance from the edge of its overbought zone. Stochastic has fallen from its overbought zone after re-entering it. On longer term weekly chart (not shown), the index closed above its 20 week and 200 week EMAs in long-term bull territory, but slipped down below its 50 week EMA. Weekly technical indicators are looking bullish. MACD is rising above its signal line in bearish zone. RSI is above its 50% level and Stochastic is inside its overbought zone, but both are showing slight downward momentum.